We met her at the end of last month, when the Borshahivky sisters and us went to sing to her at the hospital. But we couldn't teach her until she was back home because the hospital was under quarantine. Last Monday we went over to her house to become acquainted, and right away she pulled out her copy of The Book of Mormon and said she had a question about this verse- Alma 3:19 - "Now I would that ye should see that they brought upon themselves the curse; and even so doth every man that is cursed bring upon himself his own condemnation." Then she asked why people would want to do that, and why people do not want to change. We answered by saying it is hard sometimes to change and to follow Christ. Then she asked, why then does Jesus say, '' my yoke is easy, and my burden is light'' Good question! The next time we met with her she told us that the day before, her boyfriend had been over and brought all his stuff and wanted to move in with her. She was shocked and didn't know what to do. 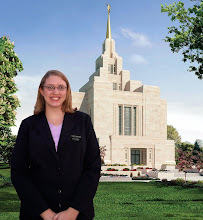 Then we talked about how we can receive answers from The Book of Mormon and she said, yes, I know, then she brought out Alma 5:16- ''I say unto you, can you imagine to yourselves that ye hear the voice of the Lord, saying unto you, in that day: Come unto me ye blessed, for behold, your works have been the works of righteousness upon the face of the earth?'' Then we shared the Plan of Salvation with her including talking a little about eternal marriage and what that means. Then she said that she sees now that she could not let him move in with her. I love that we were able to help her come to make her own decision, by listening to the spirit. She came to church yesterday and it was perfect, because in all our lessons we were talking about the Plan of Salvation, so when the teachers asked questions to the class, she was able to participate and testify of what she has learned. By the end of Relief Society, she was overflowing with the spirit. It was probably the best day at church in my life! We're meeting with her again tomorrow, and we hope that she will accept a baptismal date! Please pray for her! Halina is getting baptized on Saturday!